SIT can help you turn your passion for music into a career! The SIT School of Music offers a range of contemporary music courses in which students undertake weekly performances, organised tours and concerts and enjoy one-on-one lessons and performance workshops. Students also have access to world class recording equipment and recording studios at SIT Sound, and collaboration with audio production students provides future business networks, and of course great friendships! As well as being strongly practical, students are taught to read and transcribe music charts. Our tutors have all worked in the music industry, and prepare students for a wide range of music careers. Students can study a variety of majors, from practical performance through to songwriting or music education studies. Graduates of SIT music courses are performing, teaching and writing music throughout New Zealand and around the world. Graduates can also go on to postgraduate study as the programme develops research and critical thinking skills in its academic papers. The aim of the qualification is to provide those wishing to work in the music industry with a foundation of basic skills and knowledge required for entry level employment or/and provide a base for further education. This paper aims to introduce students to DJ Mixing and Turntablism. It will explore DJ practice both theoretically and practically, providing an understanding of the processes and techniques of the performing DJ. It will provide students with an historical overview of DJ mixing, as well as health and safety information. This will benefit students if they plan to perform and mix music. The Bachelor of Contemporary Music has been designed to prepare you for a professional career within the contemporary music sector. Six practical studies papers are at the heart of the degree, and give you the option of specialising in any one of keyboards, electric guitar, bass guitar, voice, drums or singer songwriter. The Graduate Diploma and Certificate in Contemporary Music are for students who already have a degree or similar qualification, but who are wanting to gain a further qualification in music. A born and bred Southlander, Dr Sally Bodkin-Allen left Invercargill at age 17 to study at the University of Otago in Dunedin. Completing a Mus B (Hons) and then going straight on to study her PhD in the fields of Music Education and Ethnomusicology, her passion for music has been constant throughout her career. During her PhD studies, Sally looked at musical identity and how it develops, doing a lot of her fieldwork in early childhood centres, kindergartens, kohanga reo and a’oga amata around New Zealand. If you want to work in the music industry, we've got the courses to help you get into the role of your choosing! Students can study a variety of majors, from practical performance, through to singer, songwriter or music education studies. SIT is more than Zero Fees! Our annual Kids Concert was once again a huge hit! Bachelor of Contemporary Music students spent a week entertaining the children of Southland with a lively and interactive series of concerts. Dr Sally Bodkin-Allen was involved in a number of research projects in 2014 that reflected her interests in composing, early childhood music and editing, along with her ongoing research focus in the area of student engagement in the School of Music at SIT. "'Mix-Up Week' takes place as part of the orientation programme in the School of Music. We run workshops and special activities in the first week of the year that are focused on making students feel they are part of something special." Maddy Parkins-Craig is a new addition to SIT’s staff, having started her role as a tutor in the Music and Audio Production department in July 2017. Having spent the last 9 years living and studying in Dunedin, Maddy’s experience makes her more than qualified to teach students in performance, music industry and song writing. Music tutor Pania Simmonds is originally from Te Kauwhata, a small town in North Waikato. Growing up, her musical education was mainly informal, playing in bands and learning guitar. She also had piano lessons as a young child but didn’t enjoy it and ended up quitting to switch to electric guitar. After high school, Pania moved to Dunedin to study music formally at Otago University and this has given her a more solid understanding of music and the academic world. Graduating with an honours degree, Pania has also studied at Jazz School in Wellington and has undertaken a National Certificate in Adult Education and Training (Level 5) while working here at SIT. These specialist papers are threaded through each year of the programme, supplemented by a number of other papers which give you insights into related areas of the contemporary music industry. These papers include world music perspectives, introduction to music technology, contemporary music theory, popular music since 1940, songwriting, music industry, music industry studies and contemporary style analysis. A feature of the third year is an extended project, which enables you to undertake detailed investigation into a topic or area within the field of contemporary music. SIT also offers students the opportunity to complete a double degree in the Bachelor of Audio Production and Bachelor of Contemporary Music after four years full time study. Graduates from this pathway of study will be well rounded musicians and sound engineers. They will be well versed in high quality studio recording and live sound work as well as having skills to pursue a career as performers or specialised instrumental teachers. Specialise in keyboard, electric guitar, bass guitar, drums, singer/songwriter or voice. Complete a double degree in Audio Production and Contemporary Music in just 4 years! Entry is by audition and students should already have some competence in reading musical notation. This is an opportunity for students to develop further skills in contemporary performance, songwriting, or music education. An individual programme of study can be selected to suit each applicant’s needs. After residing in Dunedin for 10 years, Sally moved to the Chatham Islands for a couple of years before coming back to Southland and taking up a position at Southern Institute of Technology (SIT). As she was submitting her PhD, Sally saw the position advertised at SIT and it all fell into place from there. Now in her 15th year of working at SIT, Sally heads up the school of Music as Programme Manager. This involves teaching on the Bachelor of Contemporary Music and the Foundation Certificate for Music and Music Technology. She also teaches students on the Bachelor of Audio Production programme, demonstrating her musical expertise. Not content with just a day job, Sally is also a composer and has a number of works published on SOUNZ. She enjoys writing for local groups such as ‘Femme’, the Southland Girls’ High School choir and has also done an arrangement for a local brass band. Femme recently took part in the Big Sing in Auckland, singing an original composition entitled ‘Crickets’, written by Sally. The best thing about her job? Watching students develop confidence as they study at SIT and seeing them grow into performers, songwriters and teachers, is one of the most satisfying aspects of the job and Dr Sally Bodkin-Allen can be proud of the many graduates she has nurtured along the way. Sally is Academic Leader for the Bachelor of Contemporary Music and Bachelor of Audio Production degrees at SIT and holds a PhD from the University of Otago in ethnomusicology and music education. Her primary focus in 2014 related to an initiative in the School of Music known as ‘Mix-Up Week’. ‘When I worked on the Committed Learners Project a few years ago it really made me think about the importance of engaging students right from the start of their studies,’ Sally explains. Three instrumental pieces were completed in 2014 and named after the young performers they were composed for. ‘Finn’s News’ for tenor sax and piano, ‘Florence’s Nightlight’ for cornet and piano, and ‘Pirate Jack’ for trombone and piano were published by SOUNZ (Centre for New Zealand Music) and have all been performed on many occasions such as the Invercargill competitions and for NCEA assessments. Sally intends to write more such pieces in 2015 and has plans to get her compositions for solo brass instruments performed at the provincial and national brass band contests. Each year the Bachelor of Contemporary Music Year 2 students join the Bachelor of Audio Production Year 1 students to put together the live performance Epic Jam. Jason Sagmyr examines the value to student engagement in this project-based assessment. Jason teaches on the Bachelor of Contemporary Music and Audio Production programmes. He is responsible for teaching first year ensemble, singer songwriter classes and music industry papers in both programmes. In 2012 Jason combined his research and teaching interests and designed a research study that would focus on Epic Jam, a concert organised and run by year one and two students on the Audio Production and Music programmes. Jason felt that while the concert provided valuable, real-world learning opportunities for the students, the process of putting the show together proved emotionally demanding for some students. ‘I had students bursting into tears in my office, so I needed to know there was valuable learning involved, and I wasn’t being too demanding,’ Jason explains. Epic Jam is a two-hour show of original music. The Music students take responsibility for organising and structuring the concert, which also acts as a fundraiser for a local charity of the students’ choice. They organise who will play, resolve artists’ logistical issues, organise the venue, attract sponsorship, promote the gig and oversee any financial aspects. The Audio students are responsible for the live sound, lighting, stage layout, stage safety and any other technical aspects of running of the show. The students must work together to make the event happen. The concert itself is not assessed but the process and the learning that occurs throughout it forms a major element of the students’ assessments for the BCM200 Music Industry Studies and BAP120 Music Industry papers. The results show that the project is a useful and pertinent piece of assessment. ‘I found out that the assessment does work,’ says Jason, and that it does equip students to step into various employment roles.’ Jason’s methodology used both questionnaires and focus groups. Students were asked if the project based assessment of Epic Jam had provided them with learning opportunities not normally found in a classroom environment. Some of the comments from the students were: ‘what you learn sticks, rather than talking about doing,’ and that it was a ‘test of initiative’. Some of the results were rather mixed, with both positive and negative responses to the question of whether the assessment had allowed them to become more involved in their own learning. One student said that it was easy to be passive if you weren’t actively doing something, while another response was that self-direction enabled learning. Jason presented his findings in a presentation at the SIT Staff Research Symposium and the National Tertiary Learning and Teaching Conference in 2013. Sagmyr, J. (2013). Are we having fun yet? ‘Six minute solution’ presentation at the National Tertiary Teaching and Learning Conference, Invercargill, New Zealand. Maddy Parkins-Craig is a new addition to SIT’s staff, having started her role as a tutor in the Music and Audio Production department in July 2017. Having spent the last 9 years living and studying in Dunedin, Maddy’s experience makes her more than qualified to teach students in performance, music industry and song writing. A recent graduate of the University of Otago, with a Doctor of Musical Arts degree and a Bachelor of Contemporary Music with Honours, Maddy plays guitar, drums, sings and produces music. Previous to working at SIT, she had been teaching drums for 6 years, as well as producing music. Feeling lucky to be working in a team that is focused on both music and audio studies, as knowledge of the two is increasingly integral in today’s music industry, Maddy is working with her students while they organise, write and perform their own showcase gigs. Music tutor Pania Simmonds is originally from Te Kauwhata, a small town in North Waikato. Growing up, her musical education was mainly informal, playing in bands and learning guitar. She also had piano lessons as a young child but didn’t enjoy it and ended up quitting to switch to electric guitar. After high school, Pania moved to Dunedin to study music formally at Otago University and this has given her a more solid understanding of music and the academic world. Graduating with an honours degree, Pania has also studied at Jazz School in Wellington and has undertaken a National Certificate in Adult Education and Training (Level 5) while working here at SIT. Currently still learning as she teaches, Pania is now studying how to facilitate and integrate numeracy and literacy into practical learning to build on the foundation music programme that SIT offers. Having played in a variety of bands, orchestras and big bands, Pania enjoys anything to do with music that is creative and honest, and loves live music. Her work experience in the music industry has mainly been playing in bands and teaching bass guitar itinerantly, privately and at Otago University. Pania’s working knowledge of music technology, supported by great resources and staff at SIT has been a positive outcome of the job. Having now worked at SIT for almost three years, she says that “the best part of working at SIT is the students that I get to meet and see graduate. I have learnt a lot from them, there are a lot of talented, bright and dedicated students that come here to study. That would have to be the highlight of the job”. Since beginning her study, Deb’s confidence has skyrocketed. She credits her tutors with imparting all their knowledge and being especially generous with their time, which has allowed her to come out of her shell and be able to enjoy the experiences the course offers. Some of her fondest memories of the past couple of years’ study include, singing in the choir, the mix up week and flash mobs. 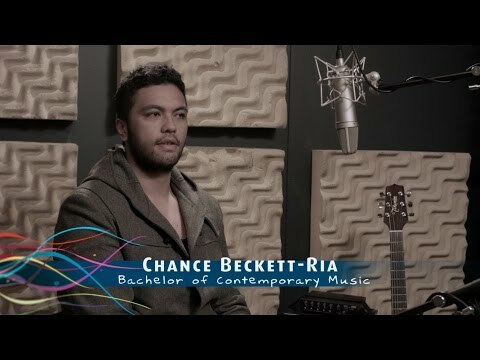 Chance is from Gisbourne, and is studying a Bachelor of Contemporary Music at SIT with a Vocal major and loves that his study is so well supported with access to all the equipment and facilities he needs. Father and daughter duo Brad and Gabbi MacClure have recently both completed a Bachelor of Contemporary Music at SIT and they’ve had plenty of fun along the way. Already a versatile musician, Brad particularly enjoyed the research aspects of the degree and intends to continue with further study. Daughter Gabbi is going to pursue teaching opportunities and work towards producing an album. “I have learned and grown so much and am ready to take on the world,’’ she says. Contemporary Music graduate Joanna Buchanan has studied the Bachelor of Contemporary Music as well as completing a Graduate Diploma in Contemporary Music at SIT. At just 22 years old, she is an accomplished singer, songwriter and pianist, as well as a member of a local band comprising of herself and her music student flatmates. Deb Wattes is no stranger to finding an outlet to celebrate, with singing featuring heavily in her life. Having a performance artist streak since she was a toddler, Deb’s parents would place her on tables to perform at parties and her and her young friends would put on dance and singing performances. Having always had the urge to sing, it hasn’t been until the last few years that Deb has taken it up in a serious way. Adult responsibilities and a position as an Administration Manager put singing on the backburner, but now that she has the time, Deb is making it a priority and has never been happier. Prior to committing to her art and making it into something more professional, Deb’s only previous experience with public performance was to pick up the karaoke microphone. After one such performance, she was told she shouldn’t be singing karaoke as it wasn’t for professional singers. This comment stuck with her and became a part of the fire that propelled her to enrol in the Bachelor of Contemporary Music. In her third year studying at Southern Institute of Technology (SIT), she maintains that without the opportunities the course has offered her, she couldn’t imagine where she would be. Some of the bonuses she has experienced through studying at SIT include, using the SIT Sound Studio and networking with other departments. The SIT Sound Studio is accessible to students and allows them to create their own music at very low cost. Through the networking opportunities, students have the chance to create music for the film students’ assignments and do some acting. Deb has also been able to get a music video produced by the film students, which is an exciting prospect and something that would be hugely expensive without the assistance of the SIT students and equipment. Deb is also the lead singer for the ‘Get Some Jazz in Ya’ jazz band which is performing at Jazz at Louie’s on Friday nights. Not content to stop there, she is also putting together another jazz band which is currently in its infancy, but hoping to be playing a couple of pieces at Louie’s by the end of April. Deb’s enthusiasm for her future jazz career and her current enjoyment of her course at SIT are infectious and her musical plans are ambitious, hoping to tour New Zealand as a jazz singer and perhaps even the U.S.A.
One of New Zealand’s top reggae bands ‘Tomorrow People’ has recently recruited two Southern Institute of Technology (SIT) Bachelor of Contemporary Music graduates. Hamo Dell and Daniel Sugrue were both recommended for the band by an SIT audio tutor. “Sometimes it's who you know not what you know,” says Daniel. Both Daniel and Hamo were initially drawn to SIT due to the Zero Fee scheme, but another big selling point for Daniel was the credibility of the tutors taking the course. “There was a strong focus on learning to read and understand the theoretical side of music, which I wanted to learn first and foremost,” he says. Daniel invested the majority of his time and energy in his final years at high school on music, therefore a career in the industry was inevitable. “The most enjoyable thing for me would probably have to be the amount of time we got to spend performing live and playing with other people,” he says. Hamo was based in Invercargill, so for her, SIT was the obvious choice. She had always loved music, singing and performing, but knew very little about it. Hamo said the course was perfect for her, touching on many aspects of music, singing, performance, the industry and a whole lot more. “The most enjoyable aspect of the course for me would definitely be the performing,” she says. Hamo is the female vocalist for Tomorrow People and says since joining she has been exposed to a range of exciting experiences that she has learnt from. Daniel plays the drums in the band and says the most exciting thing that has happened since joining the band is meeting some of his idols in the New Zealand music industry. “Every experience is new and exciting and often I am ticking things off my goal list. An interest in anything musical was the main driver behind Stephen Garton enrolling in a double degree in Audio Production and Contemporary Music with the Southern Institute of Technology (SIT). “I have always had a tremendous love and passion for anything to do with music, including composition, recording and performance,” he says. When Stephen first began writing songs and playing instruments as a young boy he says he wasn’t all that great, but he is a firm advocate of hard work paying dividends. “I would even go so far to say that it plays a much greater role in success than talent ever will. “Hard work shows commitment to your craft, and if you have to put in hours upon hours upon hours of effort to be good at something then chances are you will appreciate it far more than if you were simply “born with it”. Stephen originally planned to study classical composition at Victoria’s School of Music in Wellington, but then heard about the double degree in Audio Production and Contemporary Music offered by SIT. Stephen says his study has proven very challenging, and advises anyone thinking about completing the four year program, that good time management is your best friend. “The tutors are world class and genuinely want to see you succeed and do well,” he says. Stephen says winning the Fletcher Award, the Research Award and Top Student this year was a tremendous honour and also a very personal milestone. “To come from such humble beginnings in both areas and attain the overall “Outstanding Progress” award is a huge honour and I am very proud of the large amount of work it took to achieve it,” he says. All students in their third year of degree-level study must do a major research project, and the Three Minute Thesis competition is a part of the research paper. It is a globally recognised challenge that involves the student presenting their entire thesis in three minutes using one Powerpoint slide (without notes or slide animation). “This can be quite challenging as it is essentially a summary of four thousand plus words,” Stephen says. When he graduates next year, Stephen is undecided between post-graduate study in music education and full-time work in the industry. “The myth out there is that there is no work as a musician or audio engineer in New Zealand,” he says. He says in a country as small as New Zealand, the importance of networking during the process of your degree is crucial to being successful once you leave, and suggests this is the biggest key to success in the industry. Stephen says he would highly recommend both the audio school and the music school at SIT to anyone seeking to become a professional in the industry. Father and daughter duo Brad and Gabbi MacClure have recently completed a Bachelor of Contemporary Music at the Southern Institute of Technology (SIT) and they’ve had plenty of fun along the way. A piano technician for 30 plus years, Brad also played the guitar for 40 years and has gradually added more and more instruments to his repertoire. “Now I play many, including mandolin, fiddle and keys,” he says. Daughter Gabbi, who grew up surrounded by music, says the decision to pursue a career in the industry was a natural choice. Brad was running a music store when Gabbi was born and travelled overseas several times with the likes of ‘Pipin’ Hot’, playing mostly keys, and a little acoustic guitar. In the early 90s he was involved in the folk scene and learnt tunes to play ceilidhs or barn dances. He is interested in many other types of music too and has been known to play the fiddle in a jazz group from time to time. Gabbi on the other hand is both a singer and songwriter and plays the guitar, bass and keys. She has big plans for her immediate future. Both found their studies thoroughly enjoyable and rewarding, with Brad saying as a musically literate old person most of his study wasn’t overly challenging, but it was inspiring. “The research project and the well-designed GEN200 paper that led into it, were really inspiring for me. Gabbi was just 17 when she first came to SIT, so it has been quite a journey for her with ‘some ups and downs’ along the way, but she’s thrilled to have graduated. “I have learned and grown so much and am ready to take on the world,’’ she says. The pair were comfortable studying together with Brad saying they treated each other like classmates. Gabbi says her father has always been quirky and a lot of fun, so studying together was a cool experience. “A little bit of extra motivation and moral support with assignments didn't hurt either,” she says. Brad says the degree programme is well balanced and designed and he has been blown away at the quality of some musicians now emerging from the course. He would like to study music more, perhaps towards a Masters, but his reasons for more study would not be to get another job. “I just enjoy learning so much,” he says. Gabbi is taking a leaf out of her father’s book by making an effort never to lose the sense of fun in anything. “While there's always hard work, and he always encouraged us to be better, that quirky sense of fun will always stay with me,” she says. Claire Benedict was keen to pursue a degree in both audio production and music in order to learn both sides of the music workflow. The Southern Institute of Technology’s Double Degree in Audio Production and Contemporary Music provided the perfect solution. When making her decision to study at SIT, Claire said the course seemed to offer more versatility in the field than any other course in New Zealand and the people were helpful. “The staff went out of their way to tell me about the course,’’ she said. Claire has always loved music and wanted to perform professionally and she also had the desire to know how it was produced. ‘’I also had some experience writing music for some amateur films and wanted to know more about how to compose for film professionally too,’’ said Claire. The course exceeded her initial expectations and dispelled her first day nerves. “In honesty, I learnt what I wanted to know in the first lesson, so every class after that was beyond what I hoped for,’’ she said. “I did look at the textbooks and panicked prior to starting, wondering how I was ever going to learn all the technical audio terminology. Claire thoroughly enjoyed the learning experience and found comfort in the fact she was gaining hands-on knowledge that she could use in the real world, so much so that she has since built her own project studio. She often records her own performances in the studio, both acoustic and electronic, using industry standard software and hardware. “I complete all stages of production and post-production, having often formally composed and scored work myself to be synchronized with video,” said Claire. Her current role is multidisciplinary as she works on projects in audio and music, describing herself as an entrepreneurial freelance composer and audio engineer. “SIT gave me the physical ability to understand audio production processes and glimpses into areas which I now see are important, such as acoustically testing your studio, digitally promoting yourself and business,” Claire said. “The course was a solid starting block and it is all it needed to be for you to go your own way. Claire has obtained great satisfaction for the recognition she has received for her work. Growing up and completing her schooling in Timaru, Joanna was awarded multiple scholarships in music, and knew she wanted to continue her studies in that area. SIT’s Zero Fees scheme helped her make up her mind to head south and study at SIT and she has been more than pleasantly surprised since making the decision. “The facilities and performance opportunities are great. We had full, professional studios and Centrestage Theatre to perform in. We performed at Centrestage every Friday, putting on a concert which is awesome, it got us into the scene and I guess you could say, really introduces you to the real world”. On the flip side, as well as gaining experience in live performance, students acquire knowledge in how to record professionally and Joanna recorded an album this year which will soon be released. Socially Joanna enjoyed her time studying at SIT, making friends within her course as well as multiple people studying other subjects. As musicians, her classmates got together to jam regularly, with the tutors instigating an encouraging atmosphere in which to express themselves without fear of judgement.